Ancient Chinese political philosopher, Han Fei, tells a story of a man selling a spear and a shield. He boasts his spear “can pierce any shield”, and his shield “can defend against all spears.” What would happen if his spear were to strike his shield? Reduced drag from taxation and regulation has spurred hope for a return to an older normal: GDP above 3%. In the current stock market, irresistible forces for economic growth face seemingly insurmountable stock market barriers. Now eight years post-recession, GDP is finally spearheading economic growth. However, record operating margins stand a formidable shield against earnings growth. 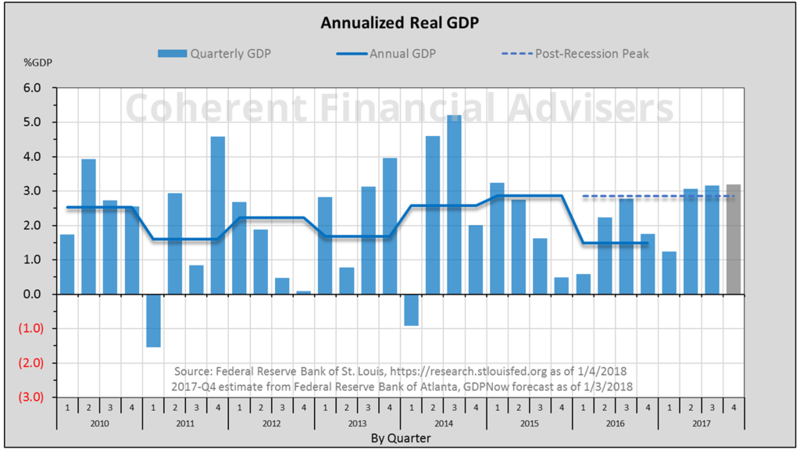 After turning positive in 2009-Q3, real GDP persisted below 3% every year through 2016. A new standard for low expectations became coined, the “new normal”. The “old normal” post-recession GDP typically exceeded 3%. It averaged 4.4% throughout the 1980s, peaking above 7%, and averaged 3.8% during the 1990s. Even during the new millennium’s secular bear, GDP hit 3.79%. As a new presidential administration introduced its economic strategies, GDP rose above 3% in the second and third quarters. Fourth quarter estimates call for 3.2%. Reduced drag from taxation and regulation has spurred hope for a return to an older normal: GDP above 3%. The S&P 500’s 2017 up-trend is technically similar to 2013. A closer examination of the components of price change reveals a significant difference. 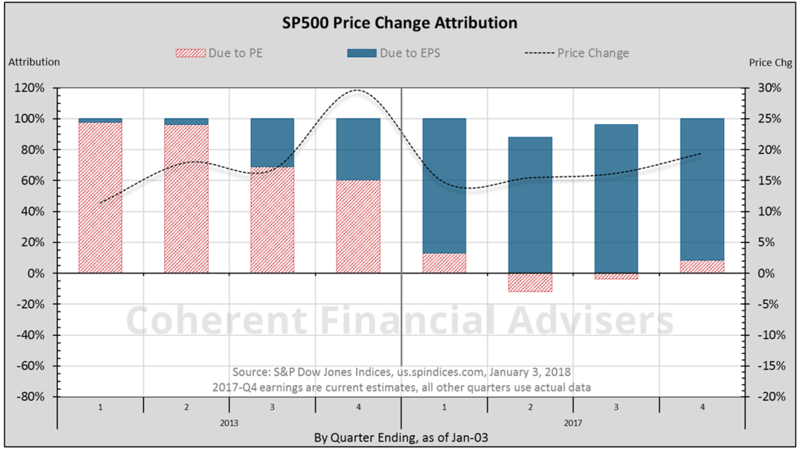 While a rising P/E ratio accounted for 81% of 2013’s price gain, about 99% of 2017’s rally is attributable to earnings growth – awesome! The problem is that 67% of earnings growth has come from rising margins, and only 33% from revenue. In last month’s Coherent Investor article, “Tax Cuts and The Stock Market”, we discussed the major challenge in 2018. Margin levels tend to cycle between a floor and a ceiling. The ceiling was tested in mid-2017. Achieving earnings growth through margins in 2018 requires setting new millennium records. The new administration has prompted a significant recalibration of future economic possibilities. Economic growth can sometimes get in its own way. An irresistible force whose momentum cannot be changed is also by definition an immovable object. They can be one and the same. Multiple sources are cited within each chart.